It’s no secret that I love chocolate. A lot. However, I have a bit of an appetite anomaly because although I love chocolate, I don’t really love chocolate cakes or chocolate desserts and you’ll rarely find me eating them. 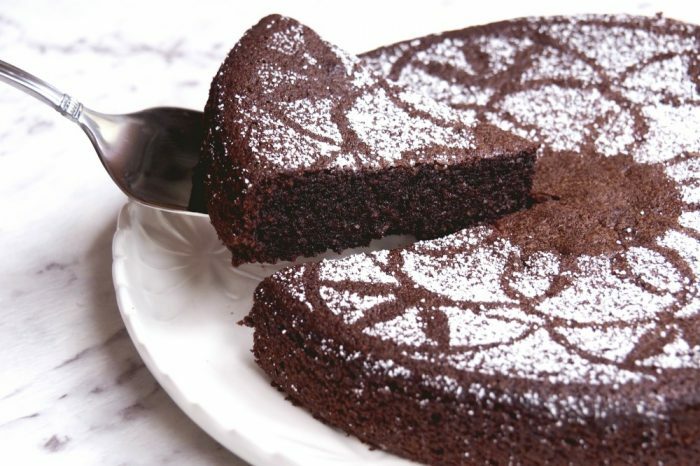 I just find them too chocolatey for my tastebuds, but this delicious cake is the exception. It’s incredibly moist (there I said it!) 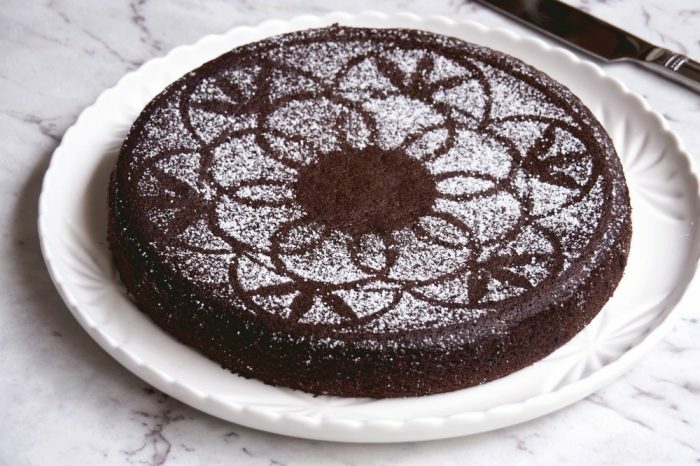 yet incredibly light and thus it is the Goldilocks of chocolate cakes, neither too rich, nor too heavy, it’s just right! 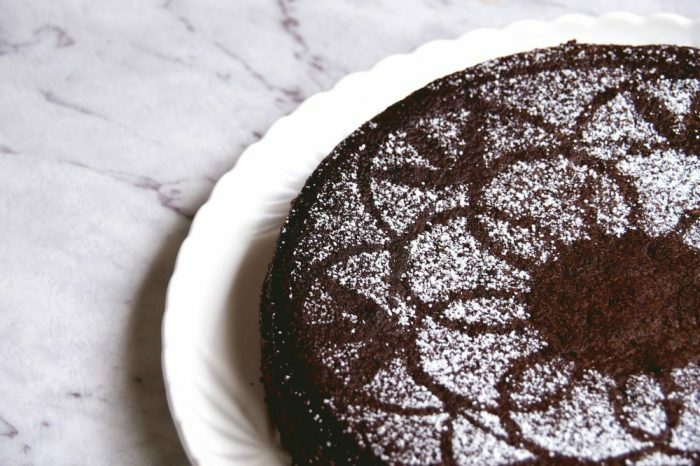 This is my go-to gluten (and dairy) free cake. It’s so quick, so easy and so versatile. 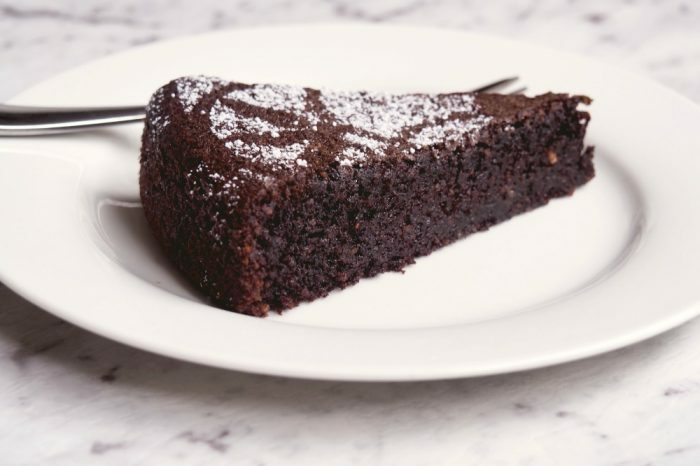 It’s perfect with a cuppa and it’s just as delicious served with some cream or ice cream for dessert, and as it’s gluten free everyone can have their cake and eat it. If you want to make this in the Thermomix, you’ll find the conversion here. So tell me, do you love chocolate? What’s your favourite kind of dessert? Preheat oven to 170 C/150 C fan-forced. Grease 23cm springform tin with a little oil and line the base with baking paper. Measure and sift the cocoa powder into a bowl or jug and whisk in the boiling water until you have a smooth, chocolatey paste. Whisk in the vanilla, then set aside to cool slightly. In another small bowl, combine the ground almonds with the bicarb and pinch of salt. Put the sugar, olive oil and eggs and beat together until you have a pale yellow, thickened cream. Pour in the cocoa mixture, beating as you go. When it is all scraped in, tip in the ground almond mixture. Scrape down the sides, and stir a little with a spatula, then pour the liquid batter into the prepared tin. Bake for 40-45 minutes or until the sides are set and the very centre, on top, still looks slightly damp. A cake tester should come out mostly clean but with a few sticky chocolate crumbs on it. Leave to cool for at least 10 minutes on a wire rack, still in the tin, and then ease the sides of the cake with a small metal spatula and spring it out of the tin. Leave to cool completely or eat while still warm with some ice cream, as a dessert. TIP! 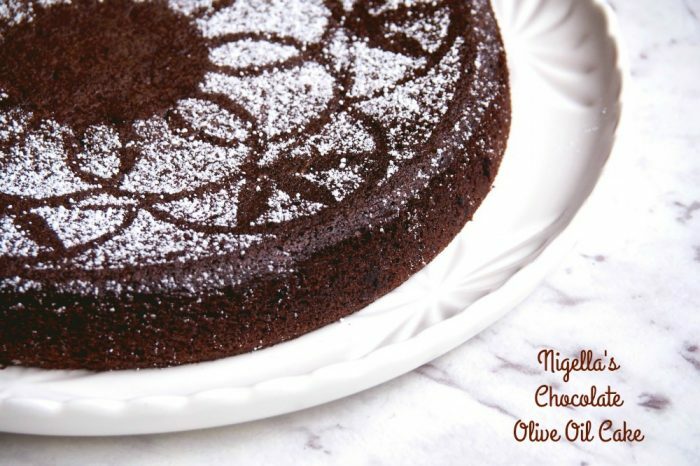 Don’t use Extra Virgin Olive Oil because it’s expensive and it has a strong flavour which can overpower the cake.